Hollon Safe is a company I respect greatly, and time has shown our customers agree whole-heartly. 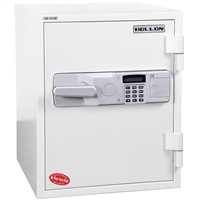 We sell ten times as many 1-hour rated Hollon Safes as we do any other brand of safe in this category, and for good reason! You get much more for your money. The 1-hour is very economical. While the 2 hour, with a door thickness that often doubles the competition and a CE rated electronic keypad, there is no short-changing going on here. Both electronic keypads have a power loss. We sell hundreds of these safes , but hvae almost never had a customer return or complain about them. An easy-access battery panel quiets fears of keypad failure. Both safes bolt to the foundation and come with bolt down hardware. With an ideal balance of security, resistance to fire and water, and a price tag that won't break the bank - you're getting one of the best safes we offer when you choose Hollon Safe. Shield your valuables from fire and water with 100% more protection than the average home safe with this Hollon fireproof safe. Featuring thicker walls, thicker doors, and no-holds-barred protection, this safe offers two hours’ worth of defense against up to an external temperature of 1750° F. A seamless body and door construction provides added strength and a sleek appearance. Get the maximum protection from both fire and water with this Hollon Home Safe, offering you a full 100% more protection than the average home sage. It promises unrestricted defense against fire with its thicker walls and doors. Its grooved door seal defends the safe’s interior against the water from sprinklers or even the fireman’s hose. To top it all off, this safe is 30-foot impact rated!